The Bulls have a day off, so that’s a good time to roll out a first look at WDBB’s charts. We will open with the reminder that the season is very early and for some of the stats, especially ERA, wOBA, and wRAA the numbers are very likely well above (or below) where they will be in a month or so. 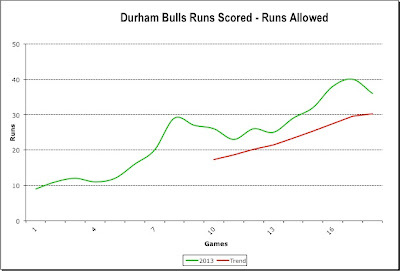 Leading off is our chart of how the Bulls are doing in scoring runs and preventing runs. We record that for every game, then plot the cumulative value and slap a trend line (in this case a 10-game moving average) on the numbers. One of the nifty things about the runs scored/runs allowed metric is that you can crank them through the Pythagorean Expectation metric and see what that predicts in terms of wins and losses. In the case of the Bulls, they are at 12-6 and the PE comes up with 12-6. How nice is that? 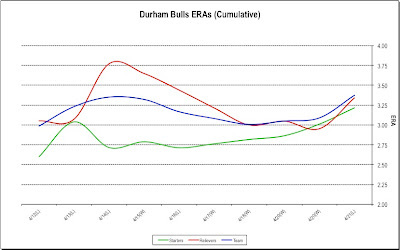 This next chart is Bulls cumulative ERA as it changes game by game. That is, after every game that games’ earned runs and innings played are added up and a new ERA calculated. What we are looking for in this chart is to separate out the starters from the relievers, and any gross trends that start emerging over time. Only the last 10 games are shown. 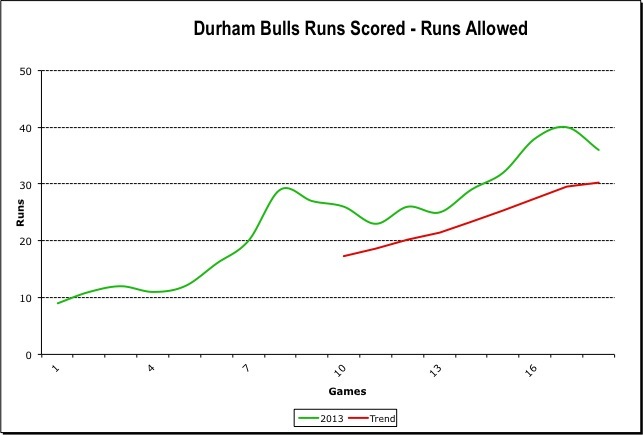 The Bulls have now played 154⅔ innings, so you can see the trends starting to stabilize. What we would hope to see is that they break off of that recent upward trend. For hitting, I’m a big fan of a stat known as Weighted On-Base Average, which is a nifty stat that throws everything into one number — singles, doubles, triples, home runs, walks, hit by pitch, and even stolen bases and caught stealing. 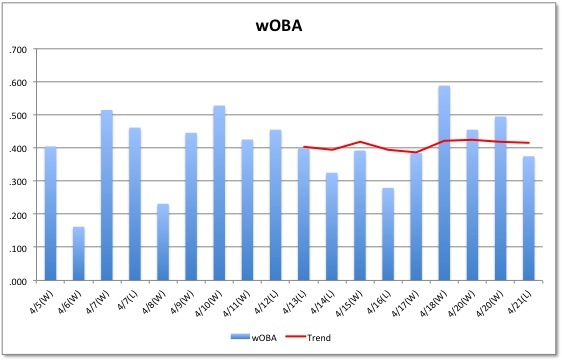 In a few more years we will see wOBA seeping into view in a lot more places. However, team wOBA isn’t often calculated. So this is handwork on my part. Could be wrong. This chart shows the game-by-game wOBA of the Bulls, then slaps a trend line (10-day moving average) over that. 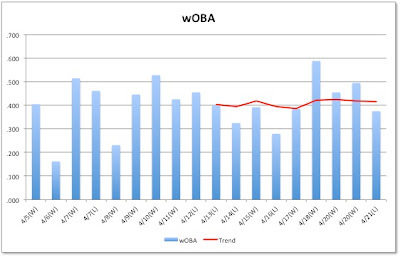 Note that this is not a cumulative wOBA as we saw in the ERA chart. 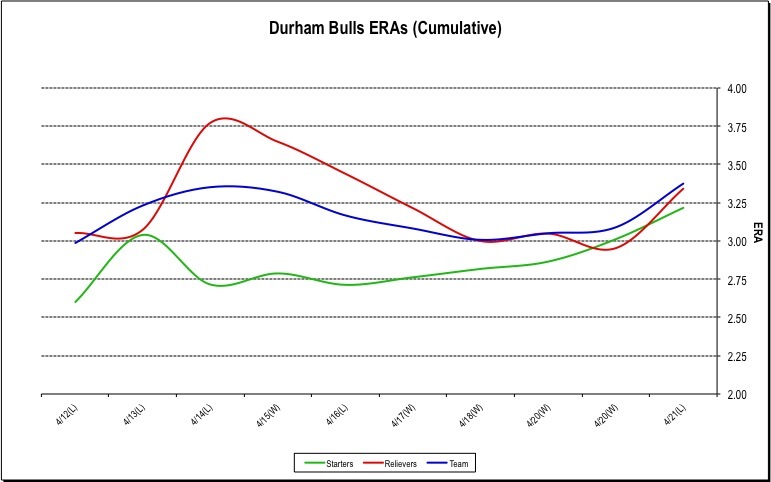 This gives us hints about how the Bulls are hitting as a team (and some hints about how good the opposing pitching has been). As you can see, a slight tick upward. 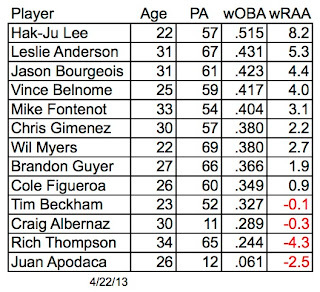 The problem I have with wOBA is that I have not yet internalized what the number means the way I have batting averages. To put it all in context, .290 could be considered awful and .400 is at the “excellent” end of the spectrum. See the table at the wOBA link. 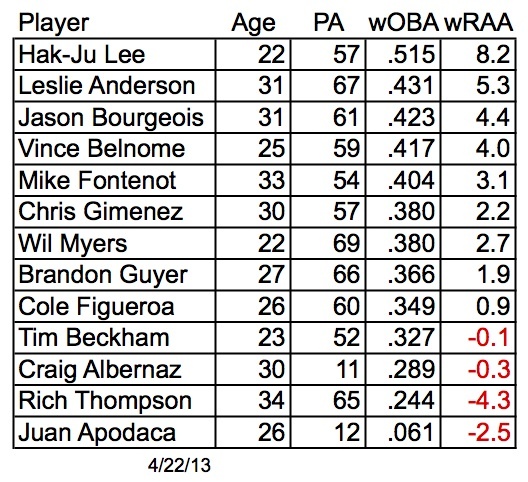 Lastly, here’s a table of our hitters that shows their wOBAs and yet another new metric, Weighted Runs Above Average. If you thought wOBA was cool, wait until you read about wRAA! Pretty simple, really. How many runs does a player contribute to a team compared to an average player? I’m less sure about these numbers since I have been too lazy to verify which “league” FanGraphs is using to compute the numbers. I think it’s the International League, but I’m not sure. Again, very small sample size, so take the numbers with a grain of salt. Also note that I’ve left Hak-Ju Lee’s name on the table just to give us all a sense of what an extraordinary year he was having before his injury. Still, we can take a couple of things away from this table. 1) This is a “mature” team. The Bulls have 5 position players 30 or over. 2) If .320 is “average” on the wOBA, then only one regular player is below that line (Rich Thompson) and 4 of them are in the plus .400 range. 3) Three of these guys are off to slow starts — Thompson, Myers, and Guyer — we can expect much more from them. Let's Go to a Ball Game!